Meanwhile, back at the umbrella factory. Last May, my landlord raised the renty by $50. On the first of this year, they raised it $85. In September, they’re going to raise it another $50. I’m deeply tired of renting. I need to discontinue my certification goal for bit, as finances are too tight. I’ll hopefully be able to come back it after September, as I’m not going to be able to afford to stay here once they raise rent again. With some luck, I’ll find a place cheap enough to have some financial wiggle room to get back into things. 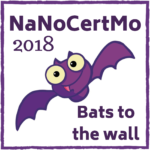 In the meantime, NaNoCertMo will need to be on hiatus. See you soon, Bats. This entry was posted in Apartment living, Career Change, Changing careers, Coursera, Divorce, Eugene, General, January, Life after divorce, Linux, Making ends meet, NaNoCertMo, Online classes, Online learning, Oregon. Bookmark the permalink.